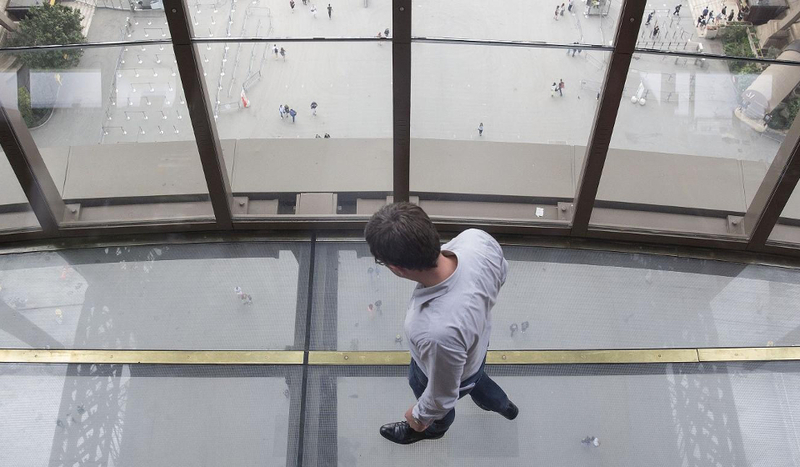 Saint-Gobain has supplied the first level of the Eiffel Tower in Paris (France), with a floor made of LITE-FLOOR XTRA GRIP anti-skid glass tiles. Located 57 meters above the ground, this space provides visitors with a double attraction: an exceptional view of the city and of the Tower itself. The transparency effect is progressive from the inside all the way to the central void across a 1.85-meter wide band. The 128 square meters of glass were manufactured by Glassolutions at its Eckelt Glas plant in AustriaThis site specializes in transforming glass for large architectural projects all over the world. I opted to remain within the geometry of the original work, while extending it through the bias of a contemporary reading. 4,586 sq. m. refurbished out of the level’s total 5,420 sq. m.
More people visited the Eiffel Tower, the world renowned symbol of France, in the past 30 years than in its first 100 years. The French architect, Alain Moatti, was in charge of the project to restore the monument’s first floor. The aim was to ensure it complied with new requirements in terms of visitor numbers and expectations, and technical standards. The latest systems improving energy performance, such as wind and solar heat energy, and the recovery of storm water, were also included in the project. The project included completely refurbishing the events area, restaurant pavilion and shop, designing a museographic pathway and adding two activities: a glass floor overlooking a void and a complete immersion video, both of which should deliver a spectacular experience for visitors. The Glassolutions France (Innovative Materials) specification department helped design and install the new 128-square meter floor made entirely of LITE-FLOOR XTRA GRIP anti-skid glass tiles manufactured by Glassolutions in the Eckelt Glas plant in Austria. This site specializes in glass transformation for large architectural projects worldwide. This area, located 57 meters above the ground, will provide visitors with an exceptional view of the city and of the Tower itself, thereby making the monument even more attractive to visitors. The floor will allow viewers to explore the structure from this overhang vantage point on the first level. The transparency effect will be progressive from the inside all the way to the central void across a 1.85-meter wide band.